Compared to previously released Mainstream Pokemon Games, Wild Pokemon Encounters now differ immensely in Pokemon: Let's Go, Eevee. 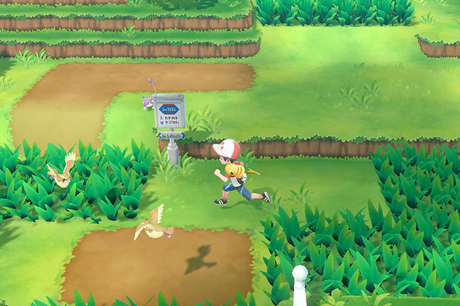 For one, Pokemon aren't hidden underneath grass or within dirt, but rather can seen while in the overworld and encountered simply by walking into them. Some Pokemon will even have certain auras found around them, letting players know if they are bigger or smaller than usual (or even if they are Shiny). If a Pokemon had a Blue aura around them, they will be larger than normal; if they have a Red aura, they will be smaller than usual. If you're lucky enough to find a Pokemon with a shiny aura that contains stars, the Pokemon will be Shiny when encountered.